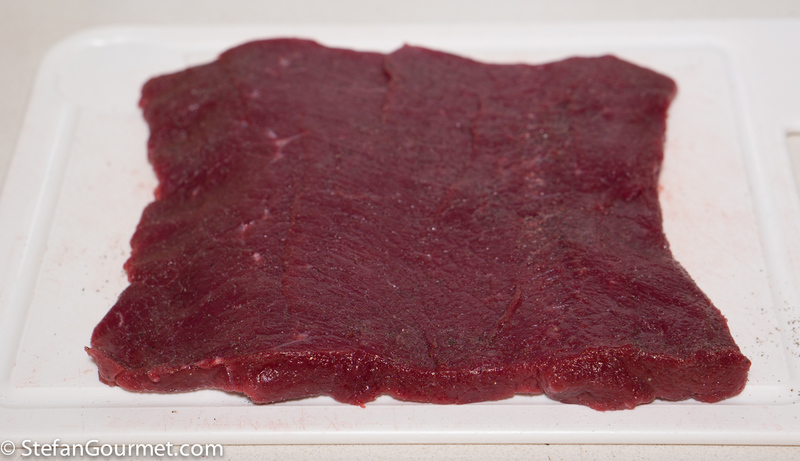 Butterfly the venison in orde to get a rectangular piece of meat that is about 6 mm (1/4 inch) thick. Season it with salt and freshly ground black pepper on both sides. Mix a tablespoon of olive oil with a tablespoon of minced rosemary and a minced clove of garlic. 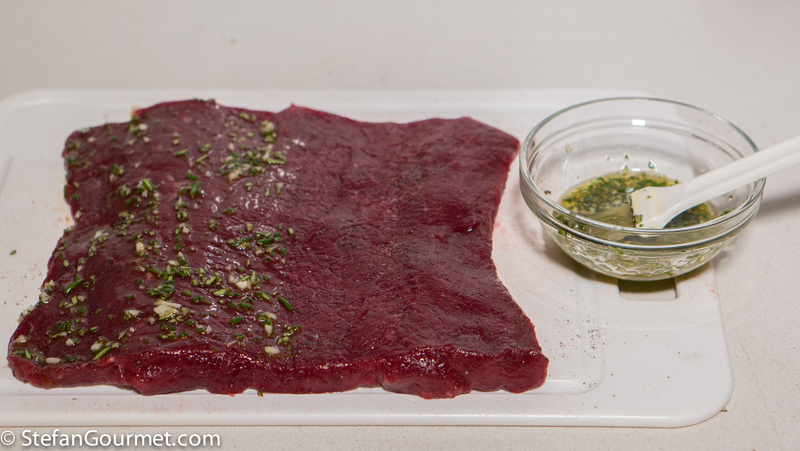 Rub one side of the venison evenly with this mixture. Cover the same side with a single layer of prosciutto. 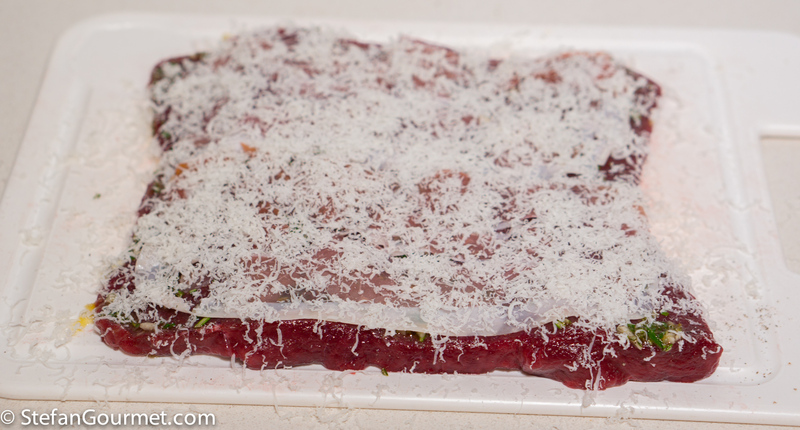 Sprinkle evenly with freshly grated parmigiano reggiano. 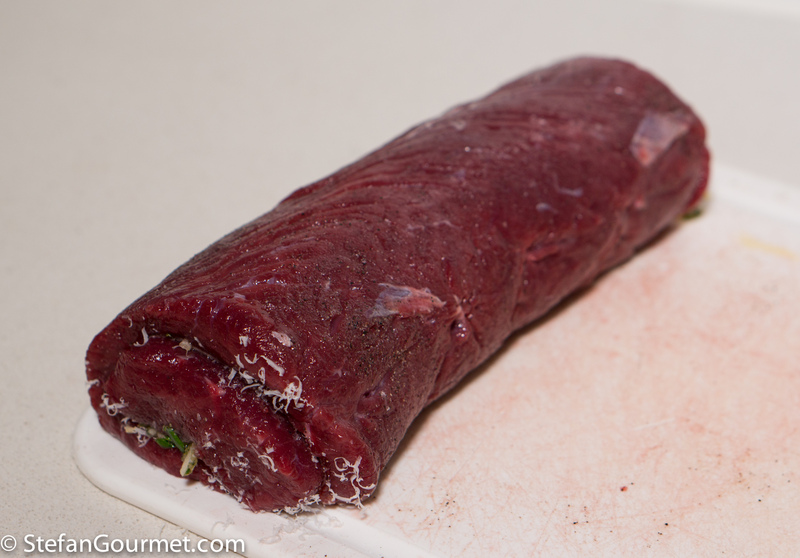 Roll the vension into a roulade (such that the filling is inside). 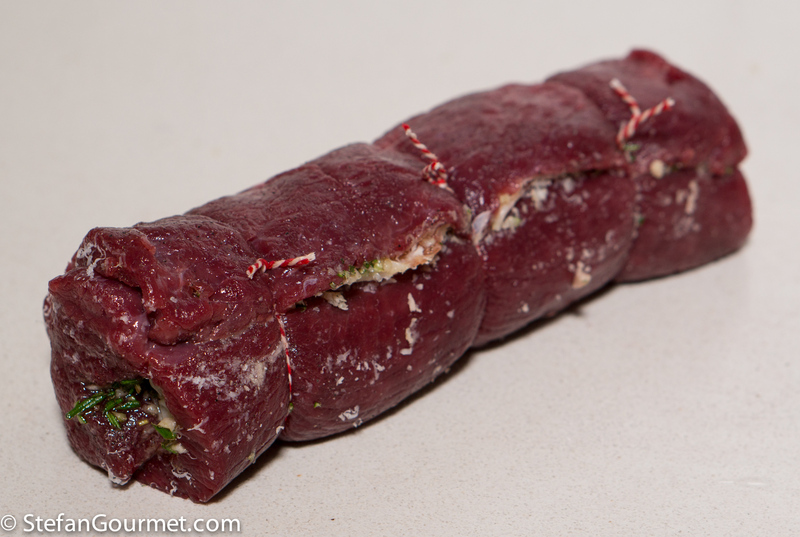 Secure the roulade with butcher’s twine. 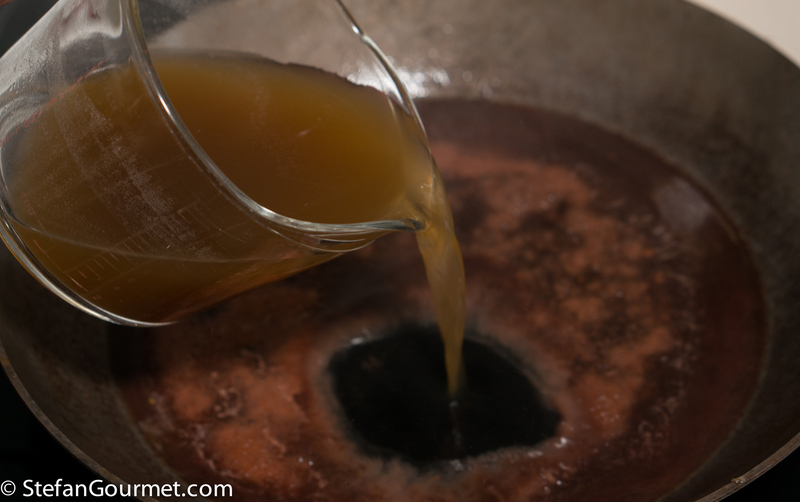 Heat 2 tablespoons of olive oil in a frying pan. 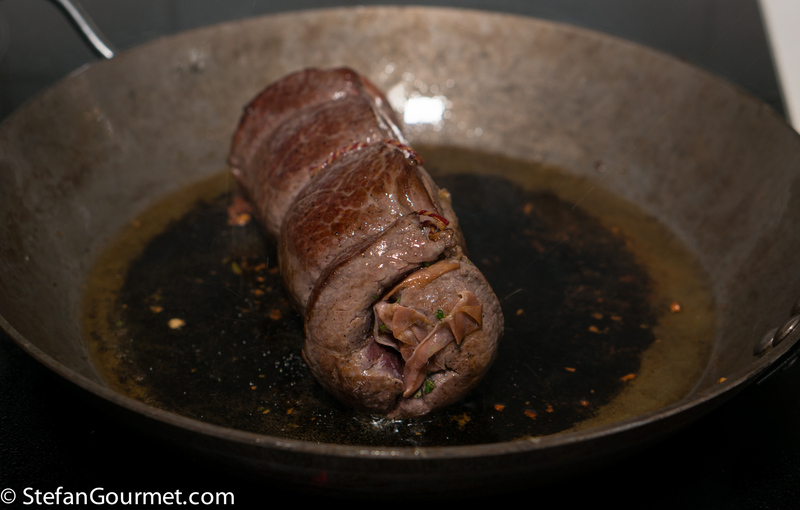 When the oil is hot, add the roulade. 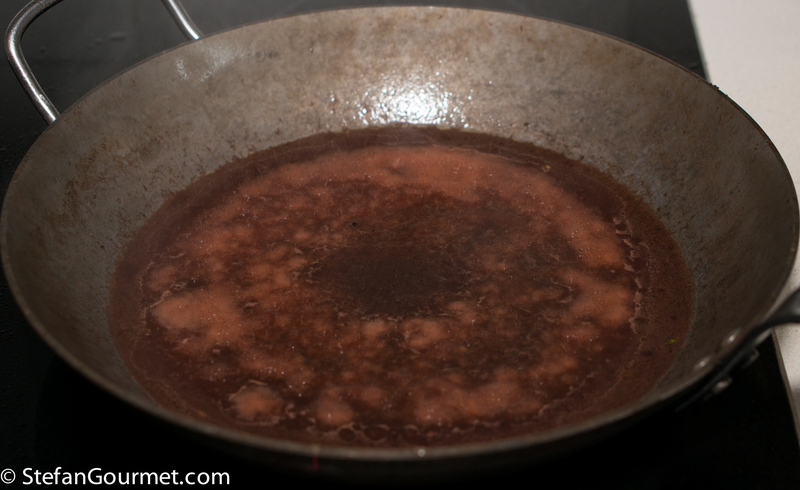 Brown it over medium-high heat on all sides, then take it out of the pan and set aside. 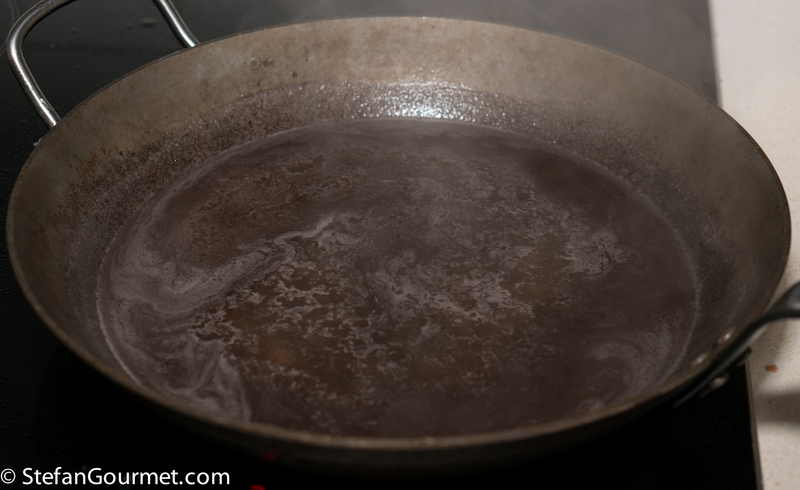 Deglaze the pan with red wine. 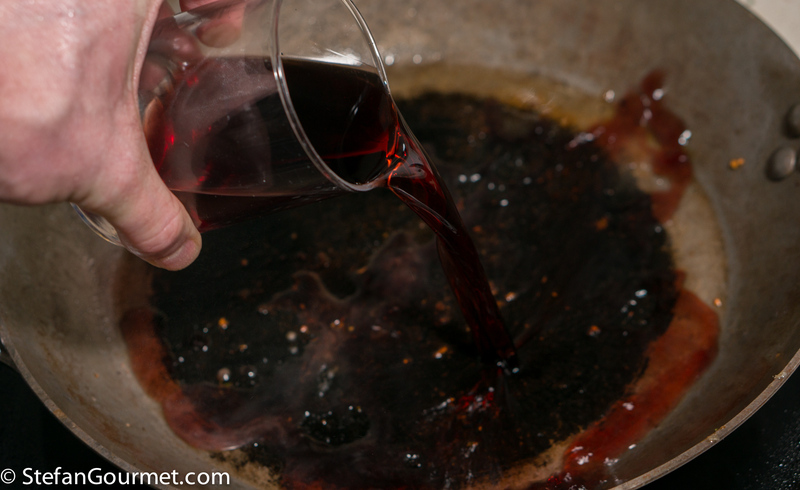 Bring the red wine to a boil, and scrape with a wooden spatula to get all of the flavor into the sauce. 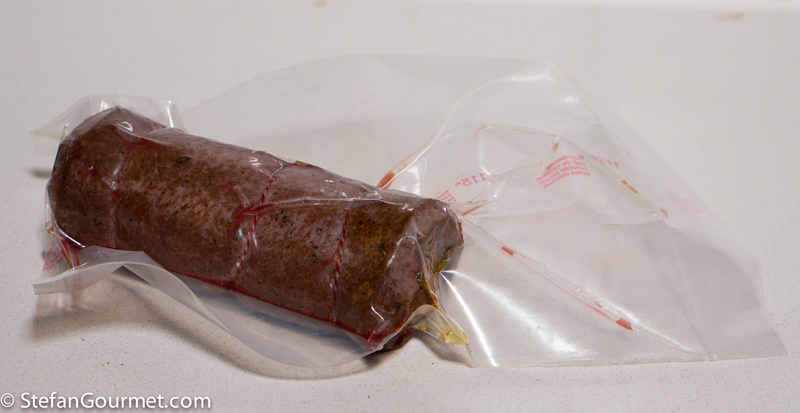 To cook sous-vide, vacuum seal the roulade once it is cool (or use a ziploc bag) and cook sous-vide at 55C/131F for 4 hours. 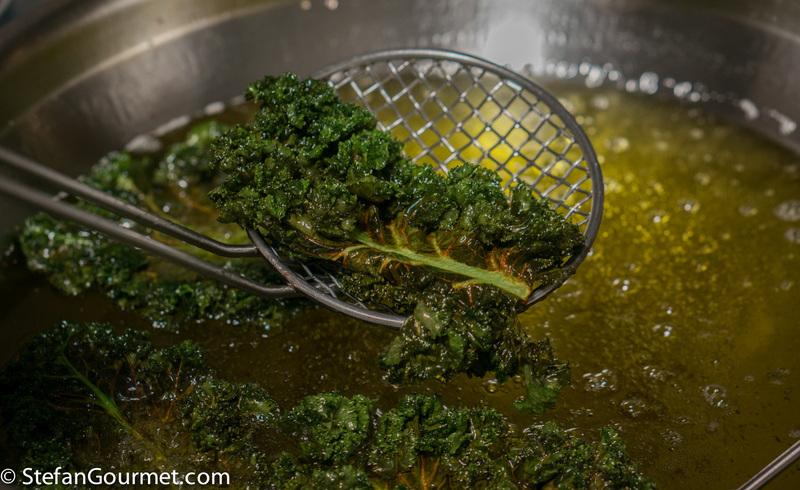 To serve, deep fry some kale (for a couple of minutes in oil of 180C/350F, drain well). Reheat the sauce. 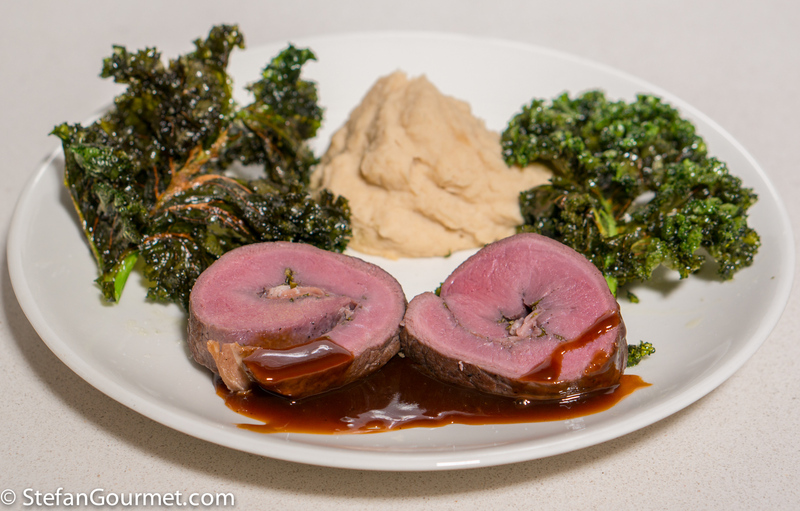 Slice the venison roulade and serve on preheated plates with the sauce, roasted celeriac puree, and deep fried kale. Season the kale with salt. 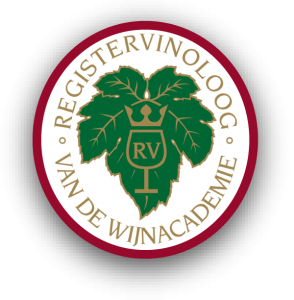 This is nice with many complex red wines, like Barolo or Brunello. 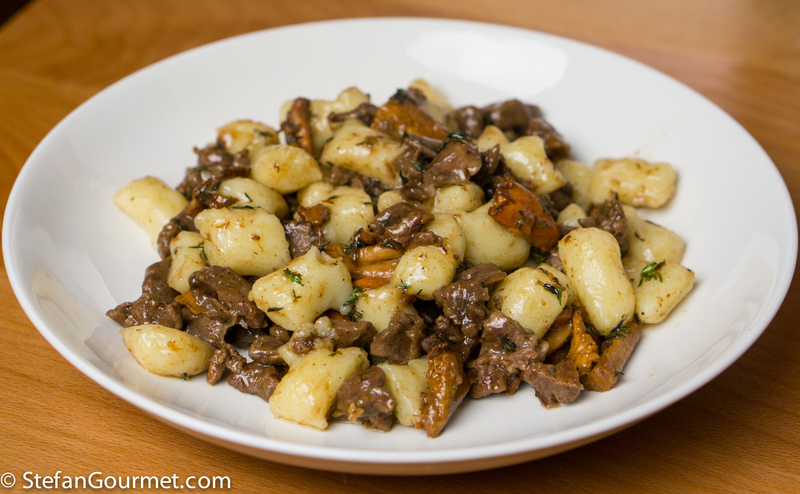 Two years ago I also posted about venison: potato gnocchi with a ragù of venison and chanterelle mushrooms. The list of ingredients is very short, but the combination of flavors and textures is very pleasant indeed. With fluffy gnocchi and tender venison, the dish is more elegant than you would expect. Pity you do not live closer. 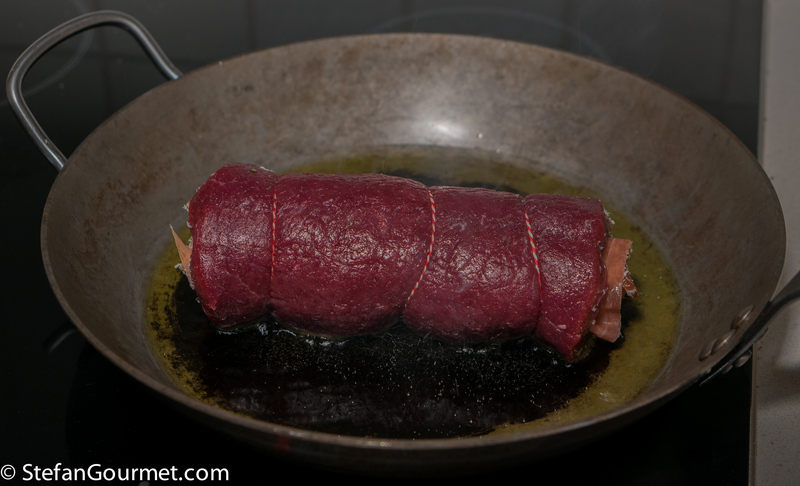 My neighbour is a hunter and frequently gives us venison but I am not a big fan unfortunately. A 4 hour cook seems to be unnecessary long. 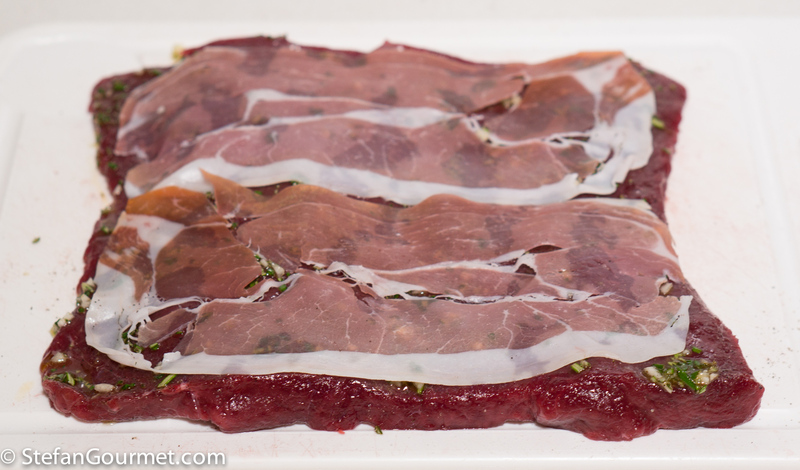 I did a whole loin for the new year dinner 1½ hour at 54.5 C and it came out very delicious and tender. Is there any issues because of the butterflying or filling that would require a longer cook? Hi Stig, it depends on the thickness and whether you want it to be pasteurized or not. If you do 1.5 hours and it is a roulade, the diameter of the roulade can only be about 4.5 centimeters for the center to reach the 54.5C. My roulade was more like 7 centimeters thick. I saw it first in a cookbook by Biba Caggiano. She writes it was created by a restaurant in Parma. I think the name makes a lot of sense, as both the prosciutto and cheese are from Parma and it looks like a rose. You can find it on restaurant menus all over Emilia-Romagna and elsewhere. Even Barilla has a recipe on its web site. For the cooking time you need a chart, as it goes by thickness. Of course with brisket it is 2 days regardless of the thickness. 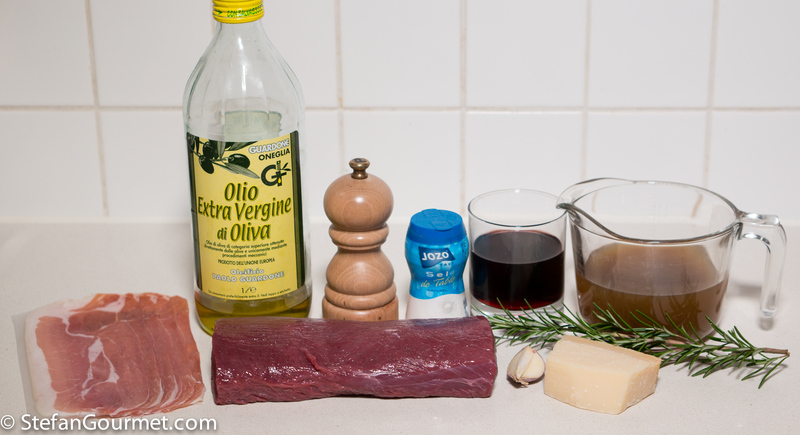 it is my kind of meat dish… very tempting and pretty easy. Yes she is from Bologna and after moving to the US (50 years ago I believe) she’s kept up with recent developments and researched for her books by visiting restaurants and trattorie in Emilia-Romagna and elsewhere in Italy. Ma guarda che combinazione! Stavo proprio cercando la ricetta di questo arrosto gustato al ristorante “Corale Verdi” nei giardini di Parma. L’originale è fatto con il filetto di manzo. Oh to see a Yule secondo away from turkey and ham! Lovely and yet quite simple and achievable! Sadly has to be tried after Christmas and with beef 🙂 ! The celeriac and kale are inspired choices! Marvellous idea! Don’t know I have ‘that’ much choice in size but I can certainly substitute with kangaroo! Love the flavour of the beastie and use it often!!! Thanks!! What a beautiful meal! My maiden name was Parma, so it also surprises me to see it in writing! They sure make good ham there!